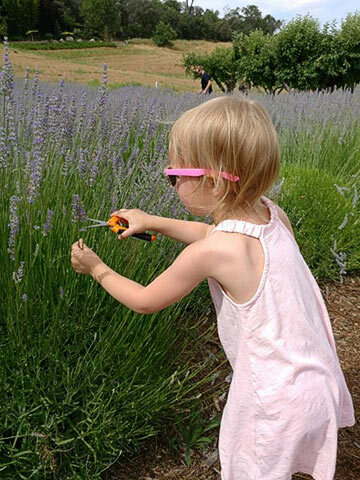 I bet you are all wondering how many people got stung at Maple Rock’s lavender picking this weekend. Truth be told, I was too. 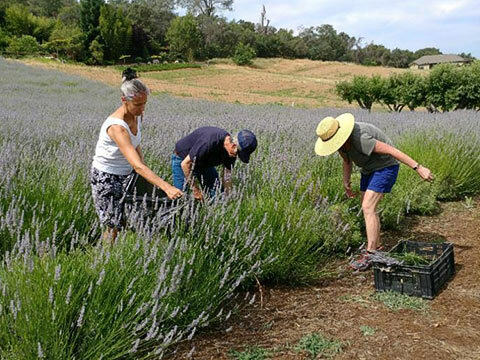 I was wondering what would happen when 400 people went waltzing into the lavender field, clippers in hand. 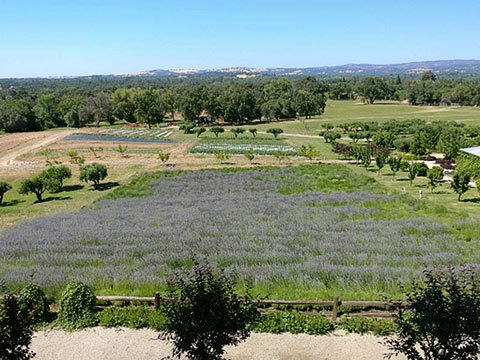 I didn’t get much sleep the night before wondering about the outcome of 400 people traipsing through the lavender. I figured somebody would get stung by a bee. It was just a question of how many people. 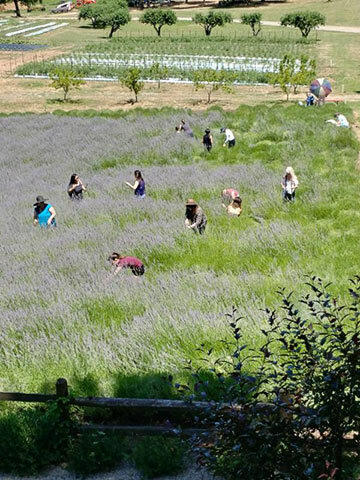 I had this vision of people gingerly frolicking, gleefully wading into the lavender, only to be turned away in sheer terror ripping through the rows as fast as they could in retreat. Well, I am happy to report that was not the case at all. 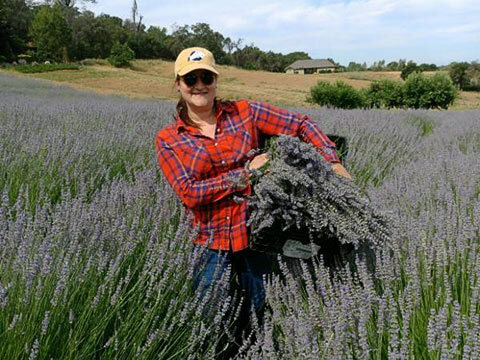 It was a beautiful weekend of lavender picking. It was a weekend full of amazing people and bees who did an amazing job tolerating the amazing people. Let me share a few pictures of the day with you. 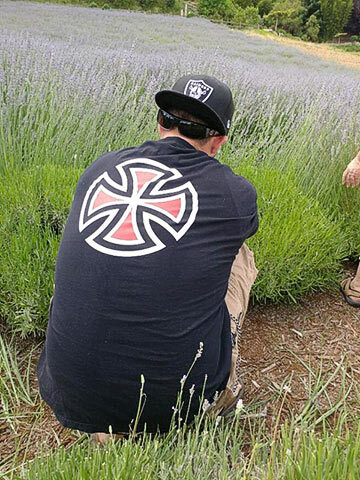 For all of you who didn’t think lavender picking was for you, it wasn’t long before this gentleman moved in and the bees moved out. 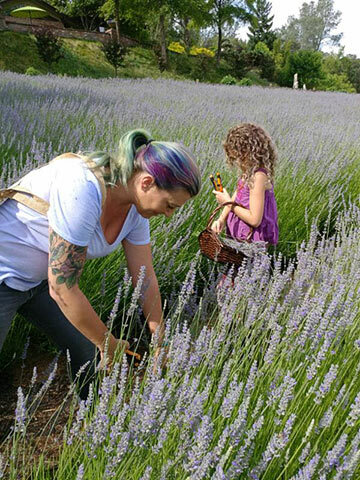 Moms and daughters showed up to pick lavender dressed in appropriate colors. I was a little bit concerned about mom having a tattoo of a flower on her arm. I think it was the bird tattooed next to the flower that kept the bees away. And this mother. I teased her a bit. I was concerned that every time she turned sideways, she’d be bee bumping. I had permission to post her picture. Thanks for being a good sport. They came to harvest. She showed up with a High-Hand hat on. Thanks for representin’. They came to harvest and harvest they did. I lost track after six garbage bags full of lavender. And then, there were the children. So fun. 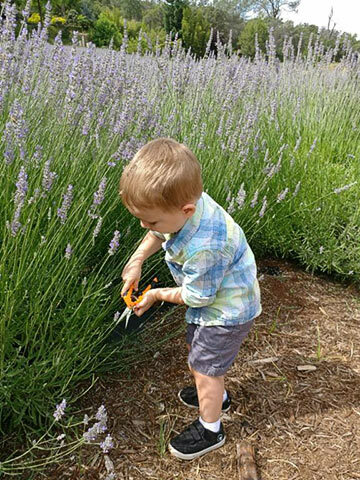 Now, I know what you’re thinking – children, bees and sharp clippers. But it was the children who were very patient and very methodical and giddy about their bouquets. No children or bees were harmed in the staging of these pictures. It was fun to watch them. There was intrigue, discovery, amazement and laughter on their faces. Do you mind if I take a break for a moment? I’ve had a lot of coffee today, backed up by water and I’m going to run to the restroom. Hang on for a minute. I’m back. As I was walking by the counter in the Flower Market I paused to look at Petunia. 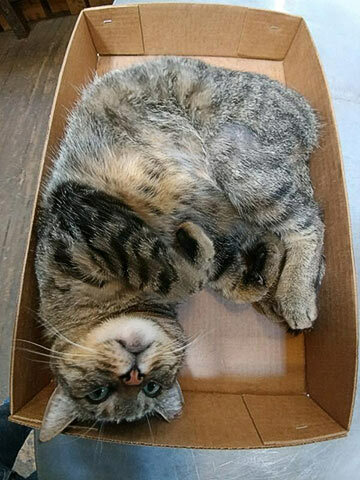 Every time we put a box on the counter, Petunia’s in the box. 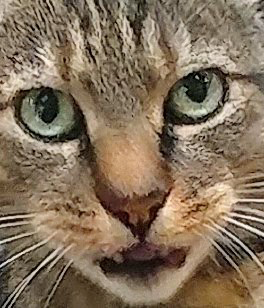 I reached out to pet her and was greeted with tiger Petunia. 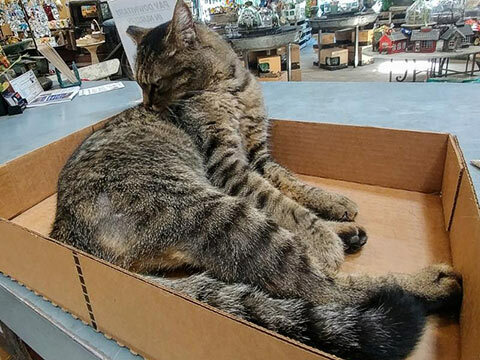 As I stood there staring at tiger Petunia pondering the cat in the box question, the only thing I can come up with is that cats are enigmatic animals meaning we just can’t figure them out. One minute I was staring at tiger cat, the next minute I was staring at furry, cute cat. You just can’t figure them out. Kind of like people and lavender. Thoughts of bee stings were on everybody’s mind, including mine. There were nervous folks. But trying to figure out the bees is like herding cats. Impossible. Bees had a job to do and so did the folks. We are rolling again. 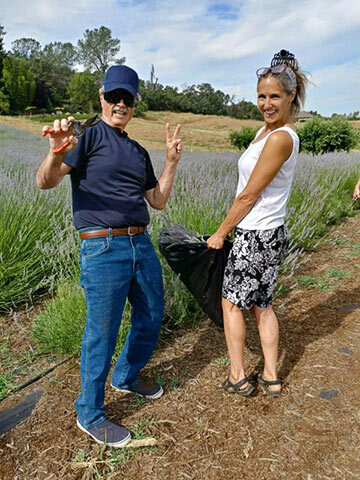 Lavender picking at Maple Rock. 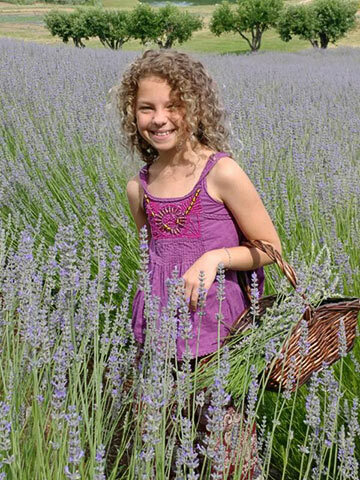 As you can see, we still have lavender. This is what our lavender field currently looks like after 400 people waded through it. As I watched the weekend’s activities, it became apparent that people were really enjoying themselves. 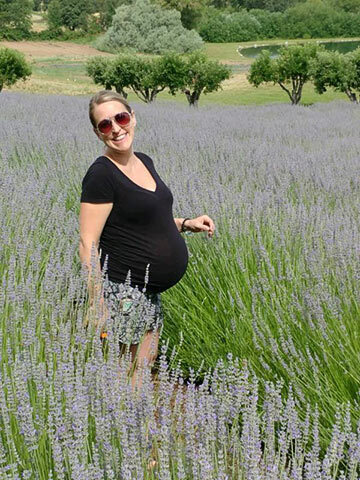 It was fun to watch families sitting on a blanket under the apple trees with their bouquets of lavender. Looking at the lavender flowers, their buds are not even fully open. Looking at Google weather, this weekend’s temperatures will be in the ’70’s and low ’80’s. 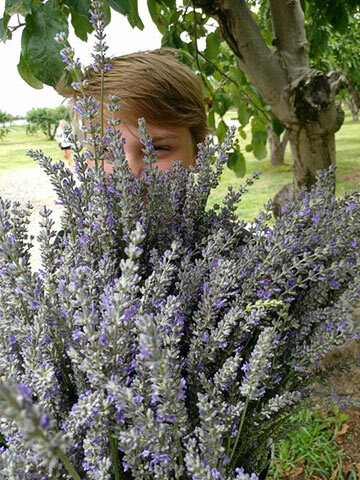 Perfect lavender picking temps. This will probably be the last weekend, so don’t miss out. Come and join us. It will be a lot of fun. 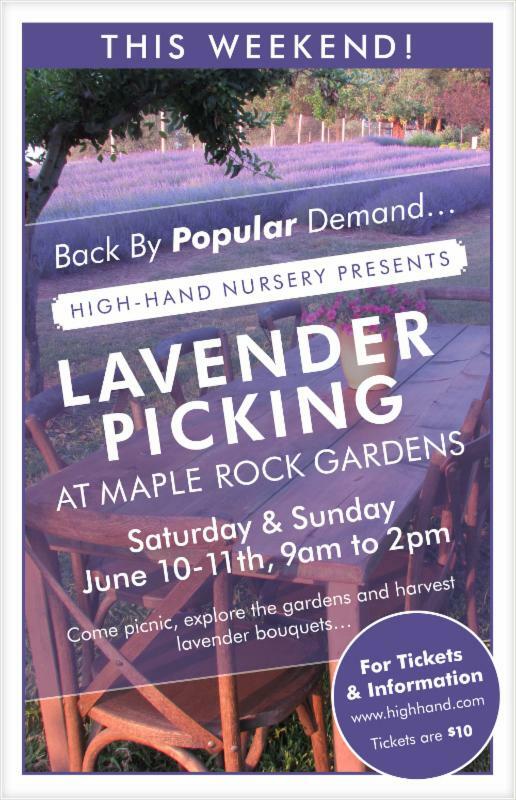 Tickets for all you can pick lavender can be purchased at our website www.highhand.com, or you can purchase them at Maple Rock when you arrive. 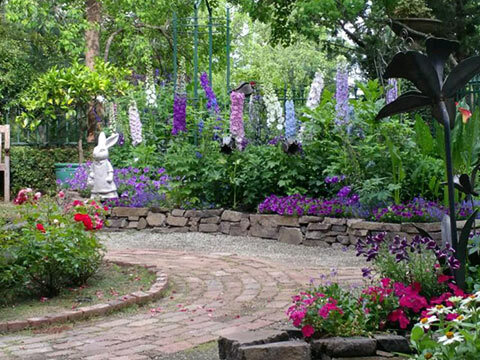 Don’t forget to tour Maple Rock Garden when you’re done picking lavender. Here’s a few pictures from last weekend. 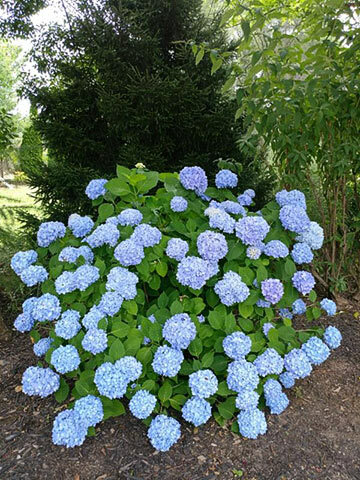 One of the many hydrangeas in the garden. No, it was not photoshopped. 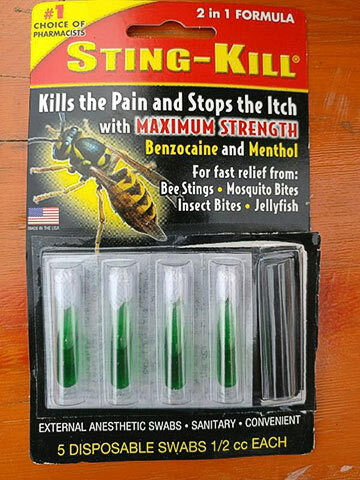 I’m sure you’re wondering the bee sting score. While I’m sure there were more bee stings than I know of, I only heard about two. But taking inventory at our bee sting station, it looks like humans and bees alike behaved nicely. 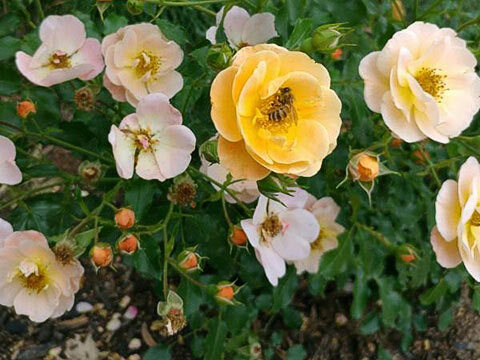 A lady got stung on her hand because she picked up a bouquet from the ground, compressing the flowers and the bee. Ouch! The other was a lady stung when a bee flew down her shirt. Probably a bee Flying While Pollinating. So, there you go. A tale of the cat, the lavender and Maple Rock this weekend. 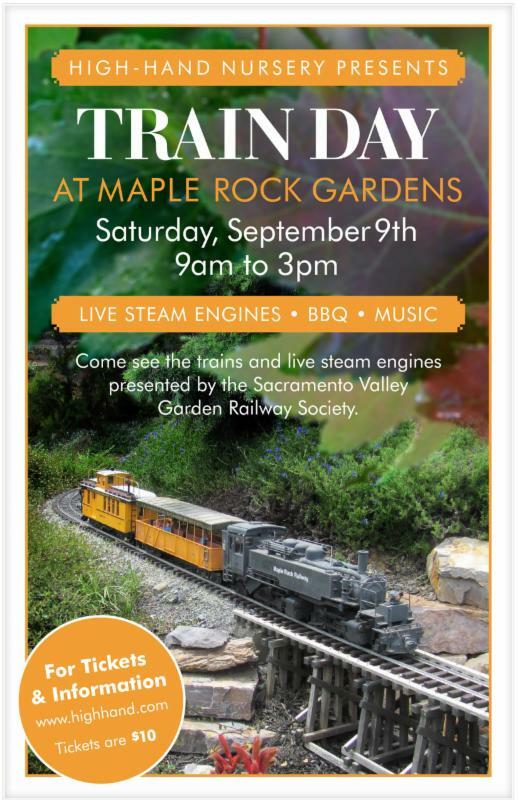 See you this weekend at Maple Rock Gardens. Bring a picnic. Relax. And be with the bees.